Want a world that is entirely free of illness and disease? Well, let's just ask our research laboratories to keep churning out medicine after medicine that will cure everything. They're sure to work, you know. After all, they'll be tested on animals, who apparently are exactly like us humans. As human beings, we regard our life to be precious, above everything else. Our body, to us, is supremely sacred; the temple that safeguards our life. It is up to us then, to protect it with all the powers that are humanly possible. Anything goes, as far as protecting human life is concerned, isn't it? So when it comes to finding cures for the many maladies that affect us, we need to conduct a lot of research to provide cutting-edge healthcare. And to make sure that these experiments do not cause any harm to precious human life, we have to test them on animals. Just about sounds perfectly humane, doesn't it? You bet it does. And this is just one of the many ways used by humankind to establish its ownership over this planet, and the creatures that inhabit it. Yes, there have been instances of animal trials benefiting humankind. But is it something we totally can't do without? Aren't there means of educating people about raising standards of hygiene, sanitation, and personal care? Can we not strive to bring about a change in people's callous attitude towards their own health and future? Today, providing clean, drinking water to the entire population of the planet can save far more lives than the drugs that are a result of animal testing. Where is the evidence proving that animal testing is absolutely and undoubtedly necessary for improving the quality of human life? Animal Testing: Does it even make sense? Who can resist a slice or two of some delicious chocolate cake? It may be an indulgence for us, but the theobromine present in chocolate can induce vomiting in dogs; not too different from what aspirin does to a cat. Case in point? Animal trials are not conclusive enough when we consider that their bodies are different from ours, and that they are being tested under laboratory conditions which are stressful and unnatural. 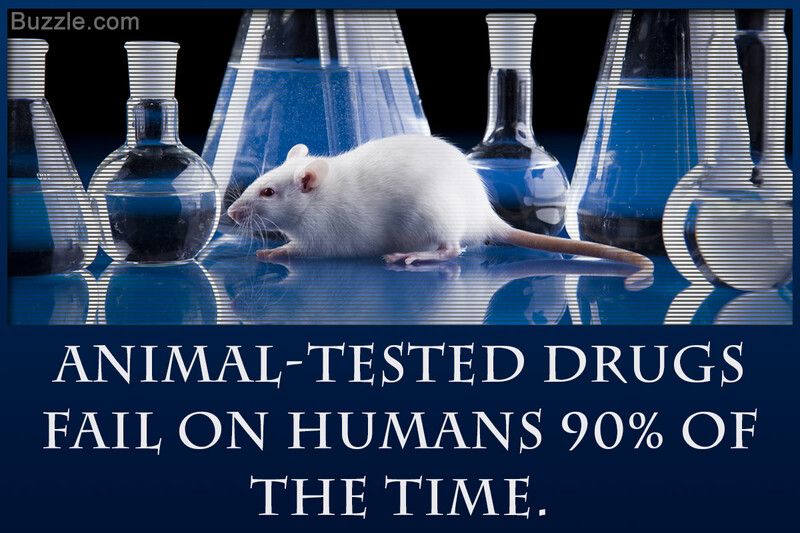 It won't be far off-track to say that animal testing is not the most reliable method of proving the safety of our drugs. For instance, we have this drug that has been safely tested on animals. It has passed all the trials, on the basis of which it has been deemed safe for human consumption. But technically speaking, the first time that this drug goes to a market, and the first consumer buys it, he/she becomes the first person to test it. So whether we like it or not, human trials are inevitable, and the risks associated with consuming it will remain the same, no matter how many animals it's been tested on. Aren't there rules, regulations, and laws that govern animal testing? No, there aren't! There is no experiment under the U.S. Animal Welfare Act that is prohibited, which means that animals can be isolated, starved, electrocuted, poisoned, drugged, and even killed (if it survives this ordeal). More specifically, this Act does not cover rats, mice, birds, and cold-blooded animals, which gives the research companies a free hand to apply their own code of morals to their business. Aren't more and more people in the developed world dying of lifestyle-induced disorders? Aren't we losing people to obesity, diabetes, heart disease, cancer, drug-dependence, and alcoholism? As we continue to grapple with mental disorders by prescribing sedatives, does anyone wonder what actually is causing our undoing? Wouldn't a lifestyle overhaul cause a far bigger and a positive change than animal testing? To some, these points may seem anti-human; they may come across as the rantings of an animal-obsessed loony. Granted, they may be. But in a world full of possibilities and alternatives, these ideals seem well-placed; logical, even. It is up to us, now, to take a stand and side for what is appropriate.